Belgian men, Pieter and Paulus Langerock, are said to be the world’s oldest living male twins. The twain who have lived together most of their lives were celebrated at their care home on Friday as they turned 103. It’s reported that till this day, the brothers who barely leave each others side have never been married, and they both share a room at their nursing home just outside the Belgian town of Ghent. 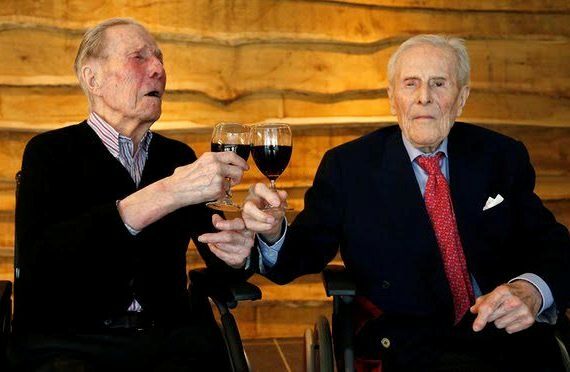 The two men who have no children or grandchildren say they are each others best friends as they celebrated with a glass of wine on Friday. After their long careers as court magistrates in the middle of the 20th century, the elegantly-dressed 103-year-olds prefer speaking French and being addressed as “Pierre and Paul”. They have another two years to go to break the record of US brothers Glen and Dale Moyer, both of whom reached 105 before dying.